Building greenhouse shelving with PVC pipe is an inexpensive way to outfit a greenhouse interior with the maximum amount of plant-holding area. PVC is light and very portable and is easily rearranged. 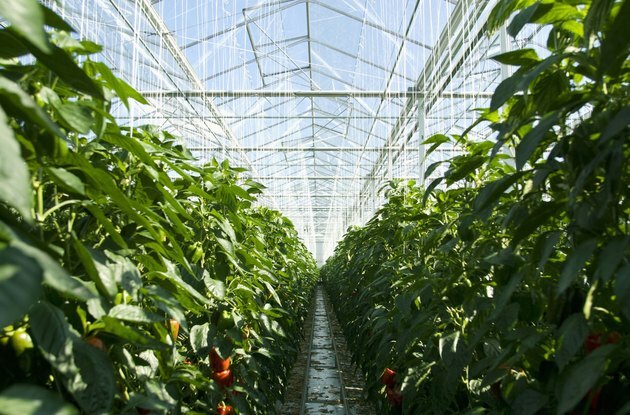 PVC is also extremely durable so it won't break, sag or warp in the constant humidity and water runoff of the typical greenhouse interior, yet working with it does not require heavy-duty tools or construction know-how. Best of all, PVC is inexpensive, so the gardener willing to build greenhouse shelving from this material gets much more shelf space for the money, easily two or three times that available for the same money spent on specialty prefabricated shelving. Measure and mark each pipe for the necessary cuts. Hook the end of a metal tape measure on the end of a length of PVC pipe and measure the necessary length, then mark with a carpenter's pencil where the cut must be made. Measure and mark lengths of PVC pipe as follows: measure and mark eight pieces of PVC pipe to measure 4 feet long, for the front and back of each shelf. Use masking tape to label each of these with a number "1." Measure and mark 10 pieces of PVC pipe to measure 21 1/16 inches for the shelf sides and use masking tape to label each of these pieces with a number "2." Mark eight pieces of PVC pipe to measure 12 3/4 inches for the top two shelf dividers. Use masking tape to label each of these pieces with a number "3." Mark eight pieces of PVC pipe to measure 15 1/2 inches for the bottom two shelf dividers. Use masking tape to label these pieces with a number "4." Mark 16 pieces of PVC pipe to measure 1 3/8 inches. These are connectors. Use masking tape to mark these with a number "5." Cut the PVC pipe where marked with a hacksaw. Place the blade of the hacksaw on the pencil mark indicating where to cut and draw the blade back and forth across the pipe until the blade cuts all the way through to the other side of the pipe. Identify on the tee connectors the stem and the crossbar of the connector's "T" shape. Glue the stem of the tee connectors to the pipe pieces labeled "1" at each end by swabbing the outer edge of each end of the pipes with PVC glue and slipping a tee connector onto the pipe ends. 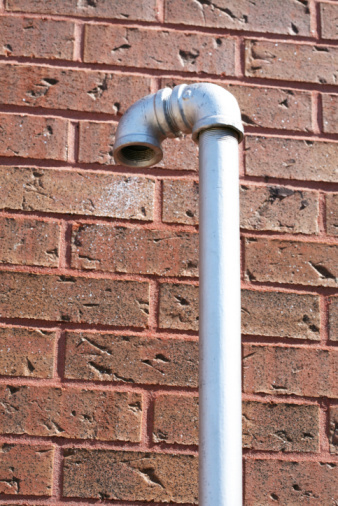 Ensure that the tee connectors on each pipe mirror each other -- they're positioned parallel. Repeat this step to glue tee connectors to eight of the number "2" pieces. Ensure that the tee connectors on each pipe are parallel. Position the "1" and "2" pieces on the floor in the shape of shelf tops -- place the long "1" pieces parallel to each other on the floor and the shorter "2" pieces at each end. Pick up a number "1" (long front/back pipe) and turn it so that the crossbar of tee connectors on each end points up and down. Glue number "5" connectors to the bottom of each "T" cross bar. Repeat this for each of the tee connectors on all the number "1" pieces. Connect the number "1" pieces to the shorter, number "2" side pieces by gluing the bottom of the number "5" connectors (attached in Step 5) to the top of the tee connectors attached to the number "2" pieces. Assemble the shelves by placing one rectangle (assembled in Step 6) on the ground and fitting a number "4" divider piece into the open side of the tee connector at each corner. Fit a second rectangle down over the four number "4" pieces sticking up from each corner of the bottom rectangle. Glue and tap with the rubber mallet to firmly seat the pipes together. Glue the last four number "4" pieces into the tee connectors at each corner, then glue another rectangle down over the ends of the number "4" pieces sticking up from each corner. Assemble the top shelf the same way using number "3" pieces in place of the number "4" pieces. Glue the last four number "3" pieces into the open tops of the tee connectors at each corner. Construct the top sides by gluing an elbow connector to each end of the last two number "2" pieces. Twist the elbow connectors so that they curve downward and fit them down over the two number "3" pieces at one end of the shelves. Repeat at the other end of the shelves.